The number 777 is significant in various religious and political contexts. According to the Bible, Lamech, the father of Noah lived for 777 years. The numbers 3 and 7 are considered both "perfect numbers" under Hebrew tradition. Christian denominations consider seven to be a holy number because Genesis says that God rested on the 7th day and man was created on the 6th day, therefore 777 is thought to be the antithesis of 666. Because God rested on the 7th day, that is the reason for the observance of the Hebrew Sabbath on the last day of the week. The 7th day of the week is indicated on the Hebrew Lunar calendar containing 13 months of four weeks each. According to the American publication, the Orthodox Study Bible, 777 represents the threefold perfection of the Trinity. The Watcher Community uses it as a reference to the 7 angels, 7 trumpets, and 7 bowls of wrath from the Book of Revelation. 777 is also found in the title of the book 777 and Other Qabalistic Writings of Aleister Crowley pertaining to the law of thelema. In other traditions and teachings, seven is seen as the perfect number that holds creation and the universe together. Religious or mythological cosmology refers to seven heavens, ancient Indian spiritual texts detail seven chakras and esoteric teachings describe seven planes of creation. The Afrikaner Resistance Movement (Afrikaner Weerstandsbeweging, AWB), a Boer-nationalist movement in South Africa, utilized the number 777 as part of their emblem. The number refers to a triumph of "God's number" 7 over the Devil's number 666. 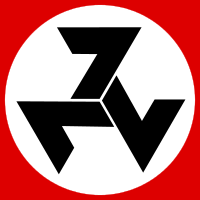 On the AWB flag, the numbers are arranged in a triskelion shape, resembling the Nazi hakenkreuz. The Philippines Late president Ferdinand Marcos used to display the number 777 on his plane and boat. Boeing, the airplane manufacturing giant, released the airplane in June 1995. The family of 777's include the 777-200, 777-200ER, the 777-300, the 777-200LR Worldliner, the 777-300ER, and the 777 Freighter. ↑ Posner, Eliezer. "On the Meaning of Three". Chabad. Retrieved 6 December 2013. ↑ Dennis, Geoffrey. "Judaism & Numbers". My Jewish Learning. Retrieved 6 December 2013. ↑ Loughran, David. "The Number 777", Stewarton Bible School, 1995. Retrieved on 25 March 2014. ↑ "Properties of the number 777". Riding the Beast. Retrieved 6 December 2013. ↑ Crowley,Aleister. ["777 And Other Qabalistic Writings of Aleister Crowley"],Weiser Books,June 1, 1986.Retrieved on March 27, 2014. ↑ Nunitus, Septem (2016). 777: Messages from the Elder Gods (777 Series Book 1). Elder Gods Press. p. 5. ASIN B01I0EUQGA. ↑ "Afrikaner Resistance Movement", LA times, 3 April 2010. Retrieved March 24, 2014. ↑ "The Three Sevens flag", 8 March 2014. Retrieved on 14 March 2014. ↑ "Boeing 777 Facts". Retrieved 5 December 2013. ↑ "Technical Information". Boeing. Retrieved 5 December 2013.